Have you prepared your Cliniko account for Coviu? In this tutorial, we'll show you how to link your Cliniko account to Coviu. We're assuming you've already set up your Cliniko account to accept online bookings. Learn how to prepare your Cliniko account before reading on. You'll need to install the Customer Connect and Appointment Bookings add-ons on your Coviu account. To check you've installed them, go to the Configure page and select the Add-ons tab. 3. 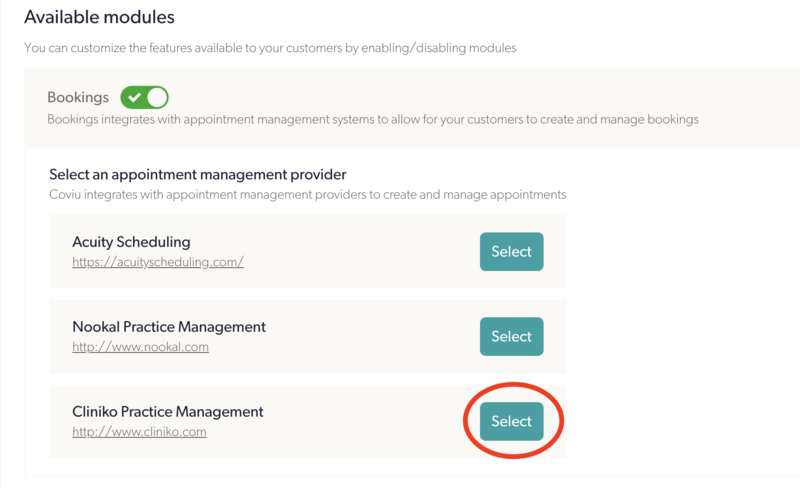 Select the Cliniko Practice Management option. Cliniko Email is the email address of the administrator of your Cliniko account (generally the person who set up your Cliniko account). You can find it by heading to Settings > General settings on your Cliniko account. 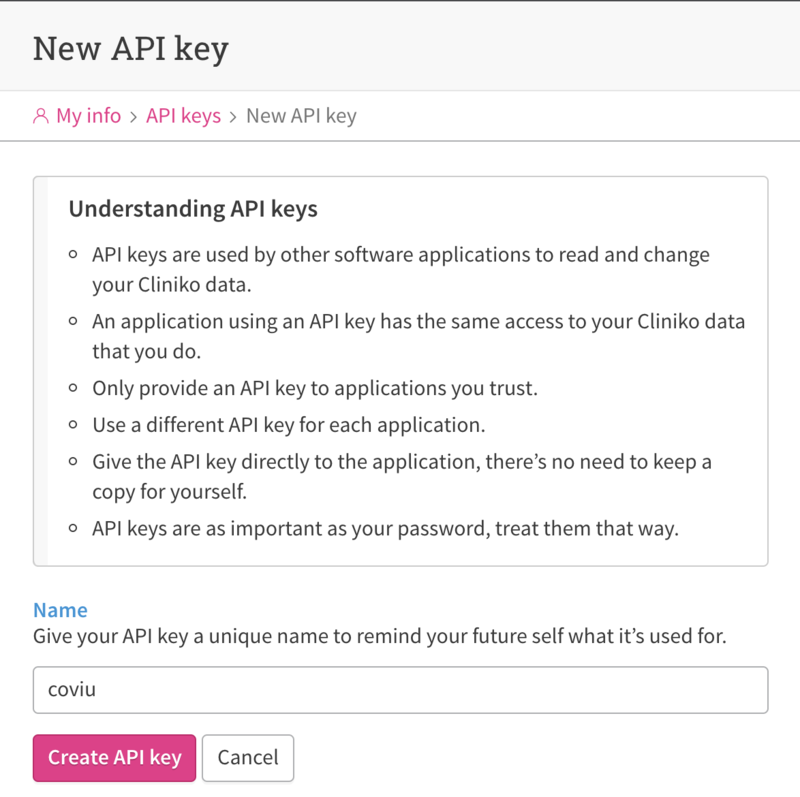 API Key is a code we need to link your Cliniko account to Coviu. i. Navigate to My info, located in the Sidebar. ii. Find the API Keys section, and select Manage API keys. iv. Give your key a name (e.g "coviu") and click Create API Key. v. Copy your new API key and paste it into the API key field in the Coviu form from Step 4. 5. Make sure to add a "Service Filter" in Coviu - "^. *" allows all services to be chosen for Coviu bookings. You can read more about further booking options at the end of the Nookal Integrations article. 6. Save your configuration. Once you're ready to accept bookings via Coviu, make sure Customer Connect has been published. Step 2 - Let your patients know they can book Coviu appointments! Your Cliniko account is now linked to Coviu. Congrats! 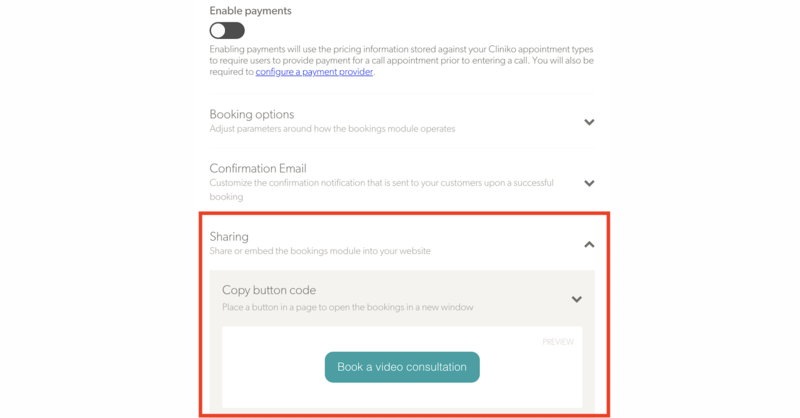 You can now direct patients to https://YOUR_ACCOUNT_NAME.coviu.com/app where they can book appointments with your practitioners. 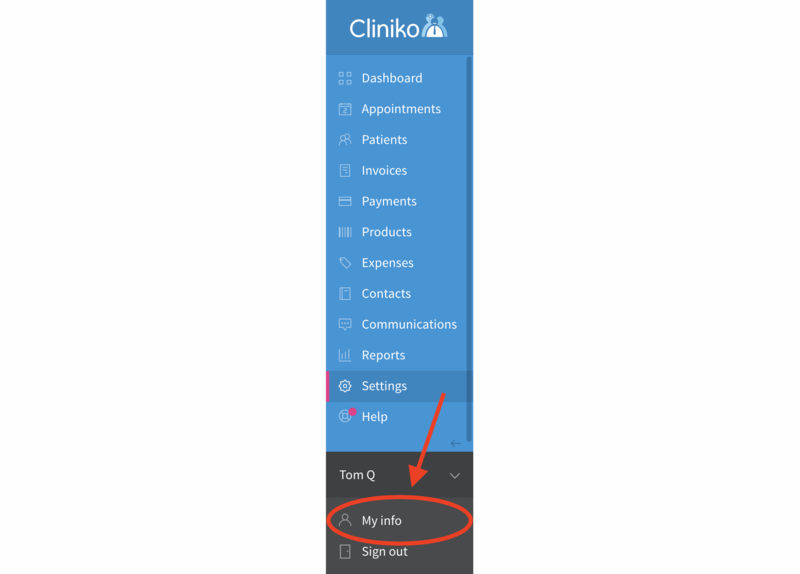 All appointments will appear in your Cliniko calendar like normal. We've also made you a simple Button that you can customise and add to your website and emails. Find it in the Cliniko Booking Module (the same place as in Step 4). Your patients can now book online consultations with you on Coviu, and all appointments will appear in your Cliniko account. Reach out to our support team and we'll help you get up and running.